This is JPO’s third performance after the grand debut in October 2007 and the Yellow River Cantata in June 08, performing again at Yayasan Sabah Auditorium on September 21st, Sunday at 7.30pm. The concert, kicking off the second season for JPO’s performance, is aimed at turning the orchestra semi-professional. Sponsors for this performance include Jerneh Insurance, Pacific Insurance, Progressive Insurance Bhd, Lonpac Insurance Bhd. and The Ministry of Tourism, Culture and Environment. The Minister of Tourism, Culture and Environment; Y.B. Datuk Masidi Manjun will be present again as the Guest of Honour. The one and a half-hour presentation promises performances by Maestros of Music in their own eras – Bach and Beethoven; as well as movie soundtracks from A-List Hollywood movies such as Pirates of the Caribbean and Prince of Egypt. JPO will be performing as a full orchestra, works like John Williams: Soundtrack Highlights from Harry Potter and the Sorcerer’s Stone, A.I (Artificial Intelligence) and The Patriot; Pirates of the Caribbean, whereas under its String Orchestra is the piece, The Prince of Egypt. The String orchestra will be accompanying two pianists, Loo Bang Hean and Grace Lee Sui Lin for the JS Bach piece, Concerto for two harpsichords, strings and continuous bass in C minor. There will be also be two piano pieces, Jesu, Joy of Man’s Desiring by Bach and Astro Piazzolla’s Adios Nonino performed before the first interval ends. The last part of the concert, performed by the Full Orchestra, is the massive and majestic Beethoven’s Symphony No.5 in C Minor. Hence this concert is a must-see concert for all music enthusiasts, with music genres ranging from Baroque to contemporary hits. Tickets are priced according to seating positions, from RM100, RM50, RM30 and RM10 (For student only). 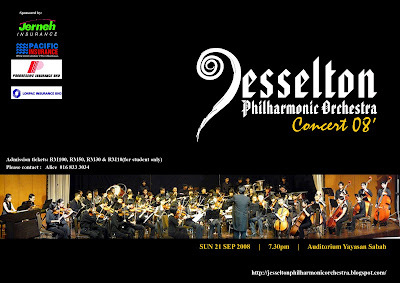 Please contact Alice at 016-833 3034 or the Sri Pelancongan Sabah at 088-232121 to obtain the concert tickets.